Tuesday Stacie reminded us that God "wants you to worship Him- and not in a deity way but in a Godly way, as in a way that doesn't separate you from Him but draws you closer," and that is absolutely true. I don't know about you, but I struggled with what worship was. How do you worship? What is the "correct" way to worship? When I was serving with Proverbs 31 Online Bible Studies I was introduced to a study method that I have become very fond of, a word study. It's pretty basic in how it is done but it really helped me to grasp some important Biblical concepts in a much deeper manner than I might have otherwise. Let me share the process with you. First, you pick the word you want to study, in this case 'worship'. Look up the modern definition for the word as a starting place. "1. the act of showing respect and love for a god especially by praying with other people who believe in the same god : the act of worshipping God or a god 2. excessive admiration for someone" according to the Merriam-Webster Dictionary. Next, we turn to Strong's Concordance. This is a concordance in which every usage of a word in the King James Bible is cross-referenced. In addition to discovering every mention of the word in the Bible, it also gives you the original Greek or Hebrew word and its definition. In this case the word 'worship' is used 108 times in the KJV and those words stem from 6+ different words. Strong's H7812 - to bow down. Strong's H6440 - to be in the presence of. Strong's H5457 - to lie stretched out on the ground with your face downwards as a sign of respect or special honor. This is the type of worship referred to in Daniel. Strong's G4576 - to revere. Strong's G3000 - to serve. Then, read each of the instances in which the word was used. I'll leave the looking up of all 108 instances to you. Write the verses down. Read how it was used. Listen for God to speak to you heart about it and write that down also. I tend to do this over a period of time. My pastor actually keeps notebooks for different words in which he records the verse and God's whispers to his heart as he comes across them in his personal study time. I love this idea as I have found that God speaks differently to me depending upon what I am dealing with, my maturity in my relationship with Him, and what I am seeking at the time. 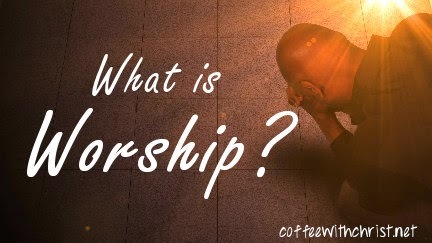 So what is worship? My take away is that worship is a physical act of showing respect to God. It is bowing down and at times even laying down before Him as an acknowledgement of who He is. Worship is a heart condition in which I revere God, where He takes His place as being King of Kings and Lord of Lords and my Saviour. Worship is an act of service, in which I chose to do His will rather than my own, or rather it is a choice to make His will my own. And worship is how I chose to live my life - in reverence of who He is, what He sacrificed for me. Does God desire our worship? Absolutely. And when you chose to worship Him it will draw you closer to Him, you will begin to discover just how awesome He is and to understand the depth of His love for you.